When you’re trying to organize an office, it can be extremely frustrating. Not only do you have to decide where everyone goes, but also how to fit them all in without encroaching on the privacy of each employee. Used office cubicle set-ups from ROF Furniture can help you create an efficient and affordable yet comfortable design for your office. Offering many name brands, our used office cubicle set-ups are built with the finest quality materials to ensure long life and lasting beauty. Whether you’re just starting out and are on a strict budget, or you’re just looking to save money on your office furniture, a used office cubicle set-up from ROF Furniture is perfect for you. Because our used office cubicle set-ups and other office systems furniture are not brand new, they are sold at a severely discounted price. However, you may end up being the only one who knows that you have a used office cubicle design, since the beauty and style of all our products is second-to-none. 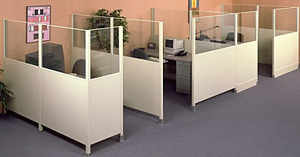 To find out more about the many benefits of a used office cubicle set-up from ROF Furniture, call or e-mail us today. 2-Drawer Lateral and File File Pedestal.